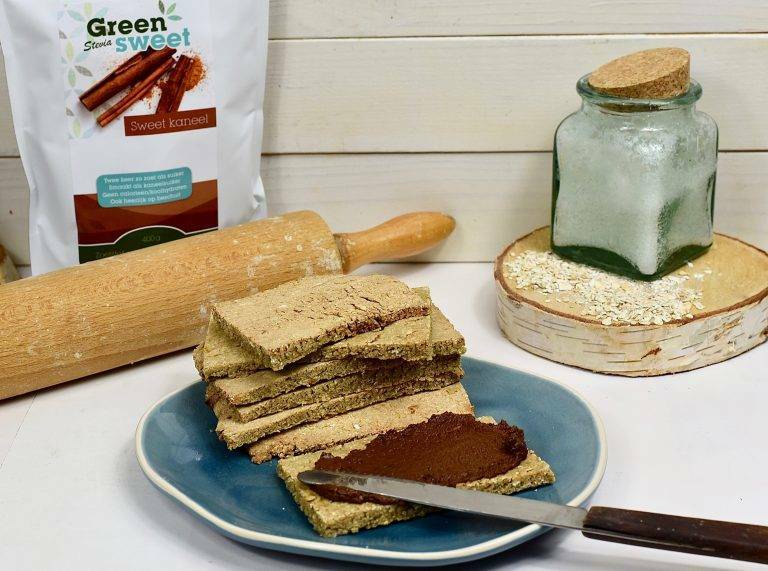 Delicious for breakfast or just in between this recipe from Monique van der Vloed in which she has processed Greensweet Sweet Cinnamon. Crackers are delicious at any time of the day. They come in many types and sizes, but unfortunately also in a lot of trouble. In crackers, a lot of additives are used when this is not necessary at all. The biggest players are salt and sugar. Fortunately, you can buy a number of crackers that have only been made from a grain and salt, but you rarely encounter them. It is therefore even more fun to make them yourself. Because nothing is simpler than that. You can add (or not) everything yourself and you can make them savory or sweet. You can make delicious sweet nutritious healthy crackers with three very simple ingredients. You can, for example, eat this as breakfast. Or enjoy nibbling in between. You can keep the crackers in a paper bag in a cool place for a few days and briefly beep in the oven or airfryer before use. Preheat the oven to 200 degrees. Place a sheet of parchment paper on a smooth surface. Mix all the ingredients in a bowl while adding hot water. When the mass has become firm, knead a dough ball and halve it. Use a rolling pin to roll half of the baking paper into a slice that is as thin as possible. The thinner the slice, the crisper the crackers become. Do the same with the other half of the dough. Cut crackers into the slab with a knife so that after baking you can easily break the crackers. Fry the crackers in the middle of the oven until done in about 25 minutes, keep checking GOOD in the meantime. Allow to cool.